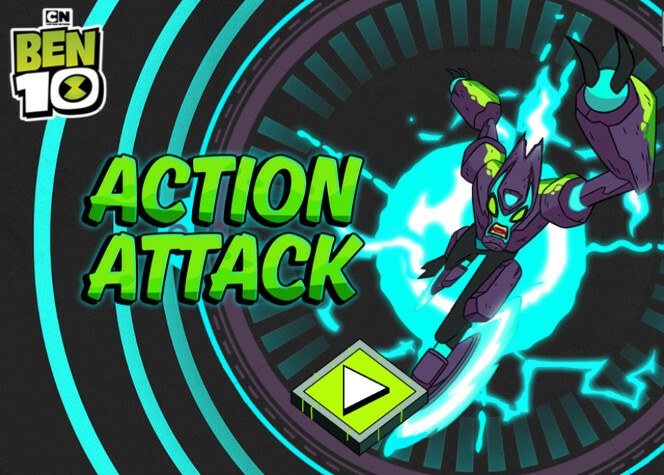 Here’s one more addition to the our collection of ben 10 running games – Ben 10 Action Attack. The evil Dr Animo has altered the omnitrix and Ben is now trapped inside it. There’s no way out except running as fast as you can and dodging anything that comes your way. Help Ben to run and escape out before the omnitrix is permanently destroyed. But before that, check out the gameplay and other details about the game! The Ben 10 Action Attack brings a running adventure at your fingertips. The game is set up inside the alien device which you know as omnitrix. Omnitrix has a lot of aliens who act as hurdles for Ben as he runs towards escaping. There will be times when you have to perform different actions or even attack the hurdles to get past them otherwise you die inside the omnitrix itself. Its your skills on which Ben’s life depends. Ben 10 Action Attack is a level based game having 9 different missions to accomplish. In each level you have to play with one of the three aliens i.e. XLR8, Cannonbolt and Fourarms. Ben as one of the aliens will start running as the level begins. You have to cross a number of hurdles to clear each level which are mentioned on the top left corner of the screen. To pass each hurdle, you must decide the correct action depending on the hurdle. There can be alien bots, laser cages, walls or fire beds that you must cross to win. You have options to Attack, Jump, Shield or Slide underneath the hurdle. For each action you will get a limited time in which you have to click the onscreen options otherwise you die if the time runs out. Help Ben to Run, Attack and Escape out before the Omnitrix is permanently destroyed! Don’t Forget to give your rating for Ben 10 Action Attack game and share your tips and tricks to win this game in the comments section below.